It's that time of year again. Bye-bye long, lazy mornings in pyjamas. Hello to the whirlwind that is getting the kids up, dressed, fed, teeth brushed and out the door all before 7:30 am. Dawn Quest MealsOurKidsLove.com has given us '5 easy back to school breakfasts' which we are sure you'll love. It's Back-to-School week. And that means no-fuss, filling breakfasts that will see them through to the lunch bell. What makes a good breakfast for kids? According to paediatric dietician Judy More it means "some carbohydrate, protein, some fruit or vegetables and a little bit of fat which could be in the form of full fat milk or yoghurt". For breakfasts that fit the bill, we've put together 5 Easy Back-to-School Breakfast Ideas that tick all the boxes. Imagine coming down to breakfast to the delicious smells of apple and cinnamon wafting round the kitchen. 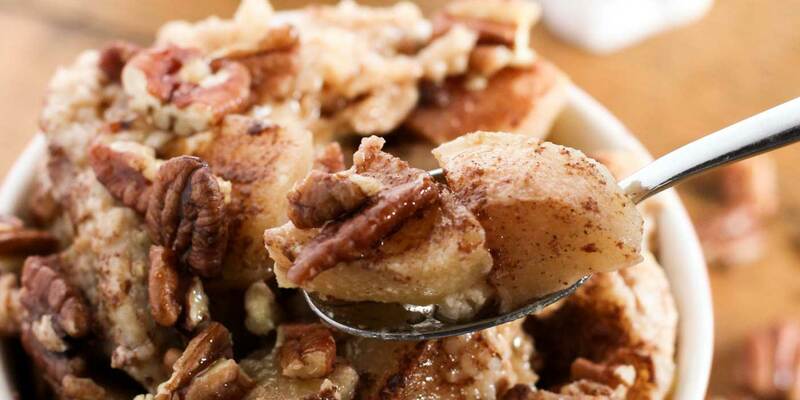 This Overnight Apple and Cinnamon Porridge recipe means you put everything in the slow cooker before you go to bed, and it’s done when you wake up. Perfect school fuel – with slow-release energy oats, fruit and a little bit of sweet spice. Put all the ingredients except for the apples into your slow cooker or bowl. Give it a good stir to mix well and dissolve the sugar (if using). Turn the slow cooker on to low and cook for 7 hours. 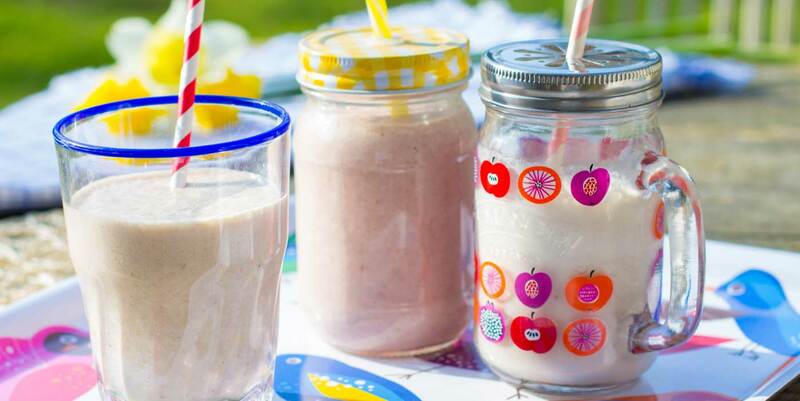 For a quick and easy breakfast kids love, smoothies really deliver. Choose a base liquid such as juice, milk or a non-dairy alternative like almond, coconut or hazelnut milk. Throw that together with some fruit and some sneaky veg in a blender and you're basically there. You can experiment with thickening the smoothie with yoghurt or ice cubes or add avocado to create a really creamy nutrient-packed drink. To pack a smoothie with extra nutrition, throw in a handful of porridge oats (oatmeal); when blended they add thickness and creaminess and help deliver slow-release energy throughout the day. I know, who am I kidding? Who has time to make pancakes on a school morning? Well that's what I used to think until I learnt that the trick to lovely hot pancakes fresh every morning is to make your batter ahead of time. 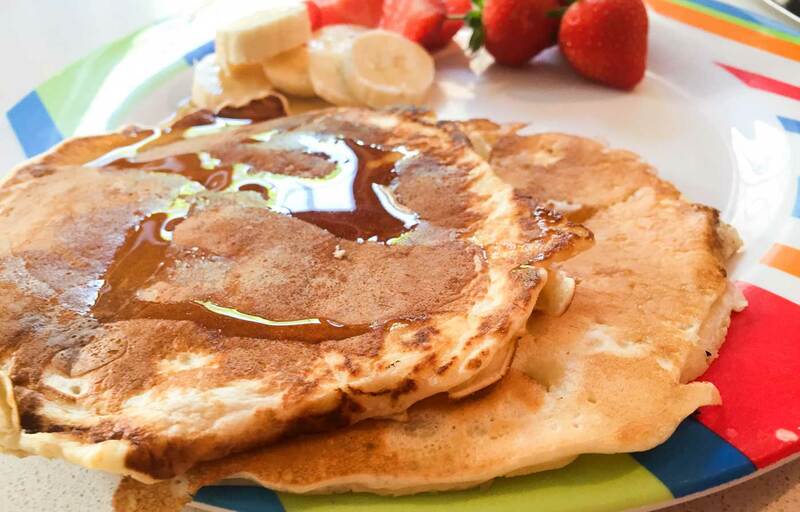 If you make pancakes on the weekend, double the ingredients and then pour the extra batter into a re-sealable food bag, seal and stand the bag in a jug in the fridge overnight. In the morning, snip off one corner and pipe the batter directly into the pan. Pancake batter can also be frozen for up to three months or you could also make up whole pancakes ahead of time, freeze or refrigerate and when you're ready to eat, pop them in the toaster for a couple of minutes and serve. Mix the flour, salt and baking powder in a bowl.In a separate bowl, beat the eggs and stir in the milk and vanilla essence. Stir the melted butter into the eggs (make sure it is cool beforehand otherwise the eggs will curdle). Add the egg mixture to the flour and stir gently just enough to moisten all the flour. Don't worry if the mixture looks very lumpy. If the batter looks a little thick add more milk. Get your flat griddle or frying pan nice and hot and add the knob of butter. Pour a ladle of mix onto the griddle to make a pancake - you choose what size you want. Wait until bubbles start to appear on the surface of the pancake and then turn over to the other side and heat for a minute or two until golden brown. Turn the heat down for the remaining pancakes.You can keep the pancakes warm in a 200C/400F/Gas Mark 6 oven until you're ready to serve. 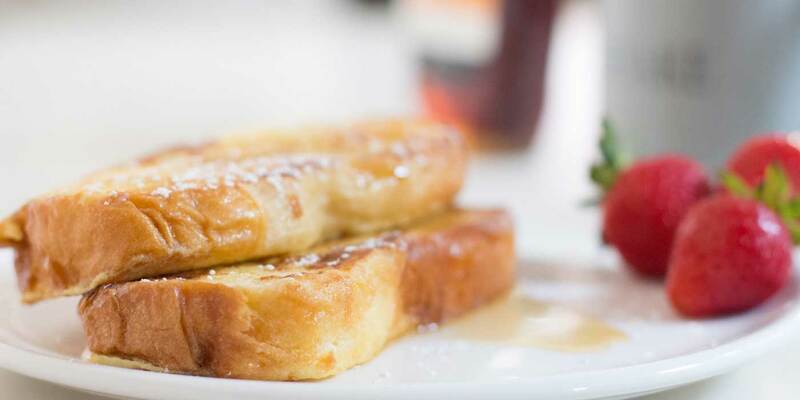 My kids love this Easy French Toast and it's one they can help you make quite easily. The clue is in the name; it's a lot simpler to make than some other French Toast recipes we've seen, with just a handful of ingredients and a simple dip and fry process. I usually serve with fruit and if I'm in the mood, some grilled bacon or pancetta. A variation on the theme is yummy Ham Eggy Bread, a childhood favourite that seems to stand the test of time. Make a ham sandwich with butter, dip in egg and milk and fry lightly in butter. Simple to make and it goes in seconds in our kitchen. Both recipes are great for using up bread that's lost its youthful glow. Whisk the eggs in a wide, rectangular bowl that is large enough to lay one slice of bread in it. Add the milk and vanilla essence and give a good stir to combine all the ingredients. Melt your butter in a frying pan on high heat. When sizzling slightly, quickly dip your bread in the egg mixture, turn over to the other side and quickly dip again. Place the egg-dipped bread in the frying pan and sizzle for a couple of minutes until golden brown. Turn the bread over and fry the other side. Serve with icing sugar, maple syrup, berries and crispy bacon. Using up leftovers from yesterday's dinner is a perfect way to start the day, even better if you roll them all up in a wrap. Grab that cold roast chicken or ham, or last night's sausages, add some cheese or veggies or a spoon of hummus, pesto or ketchup, wrap it in a tortilla and bingo - breakfast in a jiffy (for a sweeter version, try cream cheese and strawberries or bananas). 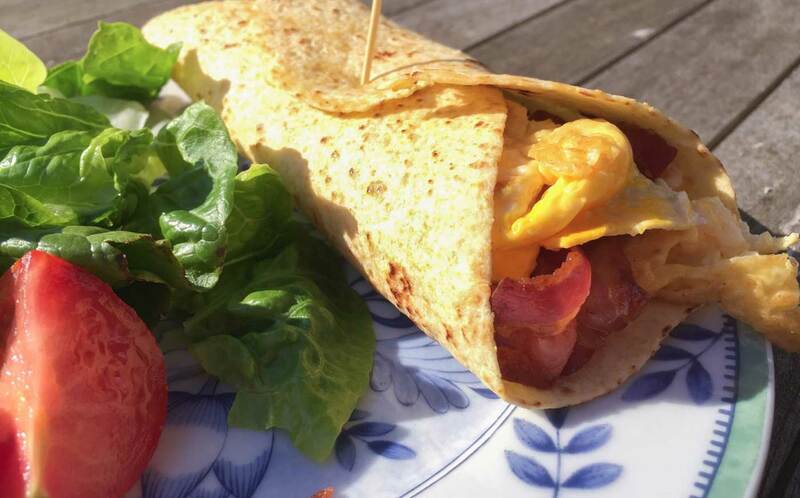 If you have a little extra time to make eggs, you can't beat a Bacon and Egg Burrito for keeping the kids happy. Grill the pancetta or bacon until crispy. Put aside in a warm spot. Heat the tortillas - either in the microwave, in an oven or frying pan, according to the instructions on the back of the packet. While the tortillas are warming, melt the butter in a frying pan on a medium-high heat. When the butter is melted, pour the eggs into the pan and allow to cook for a minute or two until they start to set. Using a spatula, push the cooked eggs into the middle of the pan to allow any uncooked egg to move to the edges. When the omelette is done, flip it over and cook for 30 seconds. Cut into wedges and you are ready to serve. Either put the eggs, bacon and tortillas on separate plates in the middle of the table so the kids can help themselves, or make up your own: lay the rashers of bacon along the middle of the tortilla, spoon a wedge of egg on top, add the sauce or salsa if using, and then wrapping the burrito into a roll and serve immediately. So there you have it - our top 5 Easy Back-to-School Breakfast Ideas to get the kids' day off to a good start. Now all I need to do is get on with the uniform labelling.